There are currently 124 people online. Corsair delivers four new 80Plus Platinum power supplies; the AX860i and AX760i with digitally-controlled power circuitry and the analog AX860 and AX760. The digital models feature DSP-control and can be monitored via the Corsair Link tool. According to Corsair, the digital design delivers very stable voltages, exceptionally low ripple and noise, and lower heat production. The press release mentions these units operate fanless until the power draw reaches 30 percent of the maximum power rating. Corsair®, a worldwide designer and supplier of high-performance components to the PC gaming hardware market, today announced the addition of four new AX series 80 PLUS Platinum rated modular power supply units (PSUs)—the AX860i and AX760i digital PSUs, and the AX860 and AX760 analog PSUs. The new AX860i and AX760i models bring the DSP-based innovations of the award-winning AX1200i digital ATX PSU to PC gamers and enthusiasts that require a PSU in the range of 760 and 860 watts. The digitally-controlled power circuitry of the PSUs provide incredibly stable voltages, and exceptionally low ripple and noise. The digital design also contributes to the 80 PLUS® Platinum certification and incredibly high energy-efficiency of up to 92%. The high efficiency also results in reduced heat, allowing the AX860i and AX760i to operate in a silent zero-RPM mode until the PSU load reaches 30% of the maximum power rating. The DSP-based design, combined with Corsair Link™ technology, provides enthusiasts with real-time control over the features and performance characteristics of their PSU all via software. This includes real-time monitoring of temperature, current draw, and power efficiency, as well as the ability to adjust the speed of the internal 140mm fan. These features also allow for a unique level of configurability, such as the ability to switch from the default single +12V rail configuration to a tailored “multi-rail” mode, with the ability to set over current protection set-points on a per-rail basis. 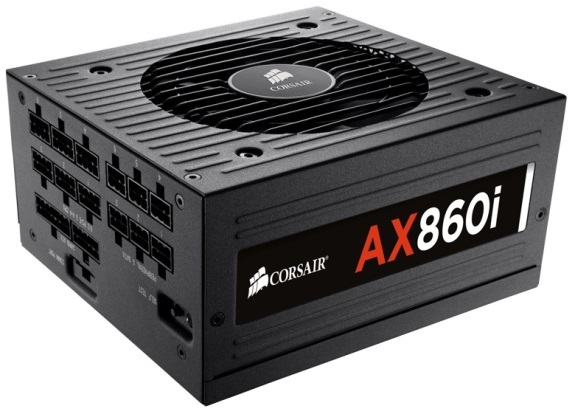 Corsair AX860 and AX760 PSUs – 80 PLUS Platinum Efficiency and Ultra Low-noise In addition to the new digital power supplies, Corsair is also revamping the traditional analog AX Series line with new AX860 and AX760 models. The new models include 80 PLUS Platinum certification, providing up to 90% energy-efficiency, and significantly lower noise levels. The new AX PSUs do not spin their fans until operating at over 60% (AX860) and 70% (AX760) of their maximum power ratings, eliminating fan noise for most common computing tasks. The new PSUs will be available beginning in November from Corsair's worldwide network of authorized distributors and resellers. They are supplied with a limited 7-year warranty and are backed up by Corsair's highly regarded customer service and technical support. Individually sleeved cable kits, in red, white, blue and black, are available for the new PSUs on http://www.corsair.com.